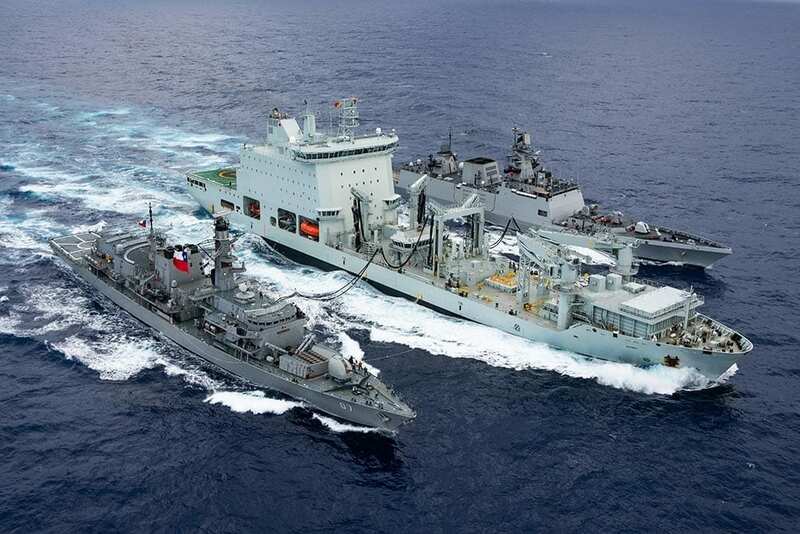 The Royal Canadian Navy’s (RCN) two auxiliary oiler replenishment (AOR) ships approached the end of their service life, and required replacement. Canada’s National Shipbuilding Strategy provided for two replacement Joint Support Ships (JSS) to be built by Seaspan at a modernized yard in North Vancouver, British Columbia. In spite of the valiant effort to keep the vessels, the 24,500 ton steam powered HMCS Protecteur and HMCS Preserver, operational until the replacements could join the fleet, that plan turned out to be impractical. The two ships were commissioned in 1969 and 1970 respectively. Corrosion and a disabling fire resulted in a state of material condition such that keeping the ships in service became impractical and cost prohibitive. Compounding that problem, the Navy’s plan to replace the ships was still years away from completion. 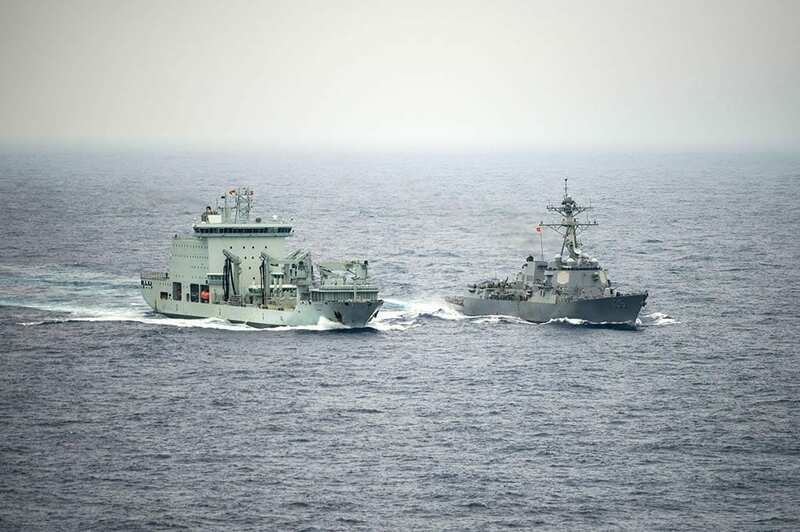 The result was a gap in the strategic capability of Canada’s navy to conduct extended operations. Because Asterix was engaged in the time-sensitive container trade, the ship was able to sail at 26 knots, faster than a tanker, which is important when sailing with the naval fleet. The actual replenishment operations took place at about 14 to 18 knots. 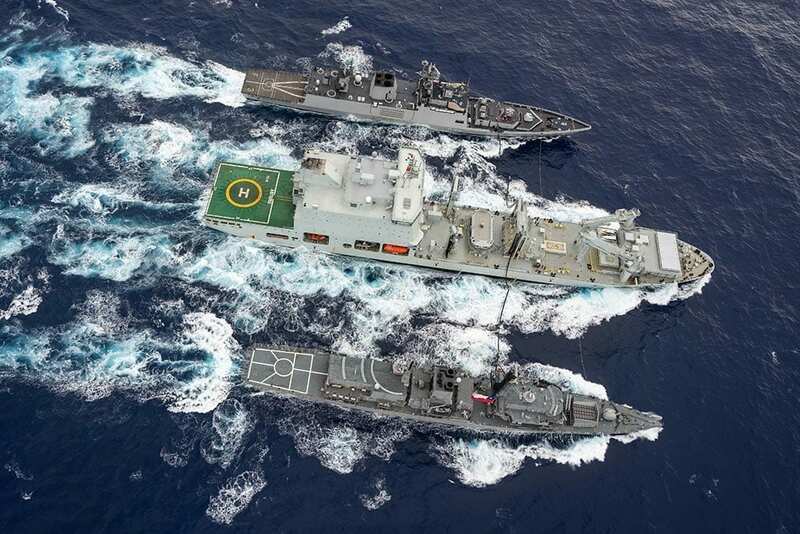 So the RCN looked for interim solutions, and established mutual logistics support agreements with other navies (Chile and Spain) to ensure its support requirements were met during combined operations and exercises. But the RCN needed their own dedicated platform that could sail where needed, when needed. Enter Asterix, a ship named for a comic book character from a village of Gauls fighting off the Romans in 50 BC. It was also the name of the containership that would undergo a major conversion for a new career as a full-service floating filling station. Sister companies Federal Fleet Services (FFS) of Ottawa and Chantier Davie of Levis, Quebec, worked together to purchase a commercial container vessel that was available, M/V Asterix, and reconfigured it to support underway replenishment for the Navy. The program was called Project Resolve. The strategy, plan and business model were entirely through Federal Fleet Services and Davie. The companies were not responding to a published requirement or request for proposals, but rather identified the opportunity as a strategic need. Spencer Fraser, CEO of Federal Fleet Services, said the result was a public-private partnership between Davie, the shipyard, and Federal Fleet Services, the operator. Federal owns the ship, and leases it to the RCN. The five-year $700 million ($530 million USD) contract includes the cost of acquiring and converting the ship and providing the crew and services. The contact has five additional option years. The government has the option to buy the ship. Federal owns, operates and maintains the Asterix, and makes sure it’s available for services. The Navy is responsible for the mission 24/7. The ship is homeported in Halifax, Nova Scotia, but the mission is to support the Royal Canadian Navy anywhere in the world they need to be. Fraser said the market conditions were right for the project. There were ships available that had been built for a specific purpose but were laid up after a few years because of changing markets. Modifying such a ship would be easier, faster and more affordable than starting with a new-build. Using the existing hull and propulsion system, taking the upper decks and reconfiguring them for a new mission was an inexpensive business model. “From the time we acquired the ship and brought to Davie and delivered the ship to the Navy was two years,” Fraser said. The two large hangars and flight deck can handle the largest helicopters in the Royal Canadian Air Force. It can carry 38 ISO containers forward for cargo, including hazardous materials and ammunition, and 20 of the containers are refrigerated to carry fresh or frozen stores. The ship has eight boats – including RHIBs, landing craft, lifeboats and fast rescue craft – that can support disaster response as well as other assignments. There are two 30-ton cranes to handle cargo, boats, vehicles and containers. Asterix is also designed to support contingency operations, such as humanitarian assistance and disaster relief. “It has a full hospital, with medical and dental treatment facilities with beds for up to 60 patients. We can make water, and can generate 7 megawatts of power, enough to light up a small city,” Fraser said. Asterix has a double hull and has many environmentally friendly systems, such as a Terragon waste gasification system that eliminates virtually all waste except metal and glass. The staterooms are based on cruise ship cabins. Fraser said Asterix most closely resembles the Military Sealift Command and Royal Fleet Auxiliary replenishment ships, sailed by civilian mariners but with military detachments for communications and operations. In a contingency response role, the ship can berth more than 500 people, and the galley can serve 500 hot meals an hour to send to responders, security personnel, or refugees or evacuees ashore. “We provided everything you might need for a multipurpose vessel,” Fraser said. After sea trials and certification of her replenishment capabilities, Asterix joined up with the multi-national Rim of the Pacific (RIMPAC) 2018 exercise off Hawaii and Southern California, not only replenishing Canadian ships but warships from many different navies, including the U.S. Navy. The Naval Replenishment Unit on board has its own commanding officer and command structure, and works in concert with the civilian master, chief engineer and chief officer. “They work as an integrated team to ensure the UNREPs go smoothly,” said Real Thibault, a RAS specialist working with Federal Fleet Services. The Navy’s mission specialists are the ones on deck, handling the controls and conducting the actual UNREP. The civilian crew is responsible for making sure the electronics, hydraulics and mechanical system are maintained and operationally ready. “MV Asterix was configured to meet our needs for a short-term, quickly-delivered, commercial solution. RCN requirements for a permanent replenishment ship like the Protecteur Class are much stricter than those required for an interim solution such as MV Asterix,” Skjerpen said. Looking ahead, Skjerpen said Asterix will continue to fill the short-term need for at-sea replenishment capability in the Pacific by supporting Canadian ships deployed on Operation Projection Indo Asia Pacific deployments in throughout the remainder of 2018 and into 2019. Meanwhile, Skjerpen said, work continues in progressing the more robust requirement set of the Joint Support Ship (which is being named the Protecteur class) to fulfill the RCN’s replenishment operational capability requirements for the long term. According to Federal Fleet Services, the Asterix could easily be fitted with additional systems and equipment to meet all RCN requirements. “There was a lot of thought put into the design and concept of how we would conduct RAS,” said Asterix’ master, Capt. Tim Allard, who took part in RIMPAC. Allard said the job has been rewarding, because he knows his customers appreciate being topped off with fuel and receiving fresh food so they can enjoy a good meal. “My background is oil and gas,” said Allard. “The naval stuff was new to me. When I joined the crew, I kept hearing, ‘We’ve got to be ready for RIMPAC.’ I thought, ‘What’s RIMPAC? I had to Google it. So to go from knowing nothing about it, to actually participating in and completing such a huge exercise, was very gratifying.